With the new year comes the beginning of tax season. And with tax season comes IRS tax scams from criminals who’d like to trick you into revealing your credit card and bank information, address, social security number, or anything else that could help them steal your money. What better way to get you to hand over your personal information than pretending to be from the IRS and scaring you with potential tax-evasion consequences? The IRS issues its annual “Dirty Dozen” tax scams list each year, and the fake IRS phone call scam usually tops the list. This scam is one of the oldest in the book, claiming nearly 3,000 victims collectively paying more than $14 million. That’s a steep price to pay for a scam that can easily be avoided if you know what to look for. Try to be mindful of the potential characteristics of the fake IRS phone call. The caller claims that you have a significant refund waiting for you or that you owe money to the IRS, which must be paid immediately. If you try to dispute, the caller threatens you with arrest or a driver’s license revocation. Both are phishing attempts to gain personal information. The IRS will not threaten you with arrest, deportation, or license revocation if you don’t pay immediately. The caller tries to establish credibility by providing a fake name and IRS badge number. He or she will generally use a common name and surname and might know the last four digits of your social security number. Sometimes, the phone call will even include recorded background noises to mimic a call site, or you may receive an accompanying bogus e-mail. The IRS always notifies taxpayers of tax issues through U.S. mail and never requests financial information, like your credit or debit card numbers, over the phone, through e-mail, or through text message. What Should You Do if You Suspect a Fraudulent Call? There are a few things you can do if you suspect you’re on the receiving end of a fraudulent call. Hang up! The IRS will never ask you for credit card numbers over the phone or request payment via prepaid debit card or wire transfer. Call the IRS back directly at 800.829.1040. If there really is an issue, an IRS employee at that line can validate the information and assist you if action on your part is required. Report the call to the Treasury Inspector General for Tax Administration by calling 800.366.4484. Forward any suspicious e-mails to phishing@irs.gov, as scam e-mails are also prevalent during tax season. Again, never respond through e-mail with personal information, such as your social security number or bank account information. Call the IRS directly via phone. Every tax season (and all year), it’s important to be aware of scams like this. 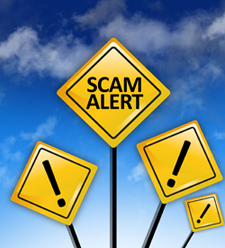 Any financial request that requires immediate attention, as these IRS phone scams will do, should raise the red flag. But keeping these pointers in mind will help you to evade (tax pun intended!) IRS tax scams and phishing attempts. Do you know of other scams that are threatening your clients' personal information? Please share with us below.